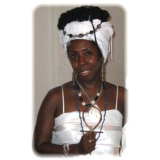 Kemetic elder high priestess, author, storyteller, musician, vocalist, multimedia producer. Educating the world about African-centered culture through multimedia. Kemetic. Hermetic. Egyptian. All point to the same world. ethics, discipline, wisdom, and sincere intention. I created the kind of book I wished had been put in my hands when I began my journey to and through Kemetic spirituality years ago. Imakhu's nuts and bolts book teaching how to incorporate Kemetic spirituality into your life. $10 download.